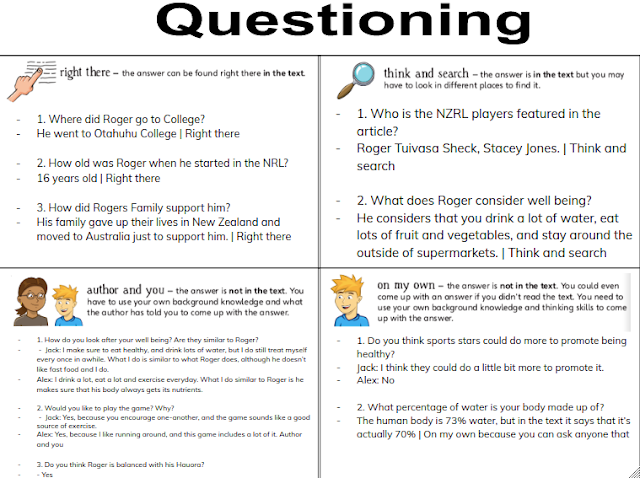 This week for reading, we answered people QAR questions about the three texts that we read. Although, there was a problem. For last weeks activity, you needed to create your questions with a partner, and for that week, we only had 4 people. So Mr Ogilvie kindly came up with some questions for us to answer. I was working with Alex for this activity, and we both knew Mr Ogilvie's tricks, and we were right. Mr Ogilvie had purposely made his questions not make sense, so that we would be more confused. Alex and I had to now think of the answers very carefully. When I'd posted this blogpost Mr Ogilvie hadn't given us the answers, so while writing this post, I don't know what our score is. Who is the NZRL players featured in the article? How do you look after your well being? Are they similar to Roger? Jack: I make sure to eat healthy, and drink lots of water, but I do still treat myself every once in awhile. What I do is similar to what Roger does, although he doesn’t like fast food and I do. Alex: I drink a lot, eat a lot and exercise everyday. What I do similar to Roger is he makes sure that his body always gets its nutrients. | Author and You (Because you have to read the text to see how Roger look after his well being). What does Roger consider well being? He considers that you drink a lot of water, eat lots of fruit and vegetables, and stay around the outside of supermarkets. | Think and search (Because there are multiple things that he considers, and they aren’t in the same positions). Where did Roger go to College? He went to Otahuhu College | Right there (Because there was only 1 answer to this question, and it was in a position where you could point right at the answer). How old was Roger when he started in the NRL? 16 years old | Right there (Because there was only 1 answer to this question, and it was in a position where you could point right at the answer). Would you like to play the game? Why? Jack: Yes, because you encourage one-another, and the game sounds like a good source of exercise. Alex: Yes, because I like running around, and this game includes a lot of it. Author and you (Because you have to read the text, and read the rules to this game). Do you think Roger is balanced with his Hauora? Do you think sports stars could do more to promote being healthy? Jack: I think they could do a little bit more to promote it. How did Rogers Family support him? What percentage of water is your body made up of?